As co-owner and Chief Operating Officer for corporate caterer and event planning company Tasty Catering, Larry Walter provides the leadership and vision necessary to ensure the company has the proper operational controls, administrative and reporting procedures and people systems in place to create and manage growth. With his respectful and collaborative style, Larry is known for his ability to quickly solve day-to-day problems with practical solutions. With a proven track record, Larry’s client list includes Big Ten Conference, Festivities Catering & Special Events and UC at Berkeley Cal Catering. Prior to Tasty Catering, Larry was co-owner/operator of Chicago-area fast food restaurant Tasty Dawg. Through proven creativity and best business practices, Larry has risen to the top of his industry as one of the Leading Caterers of America. 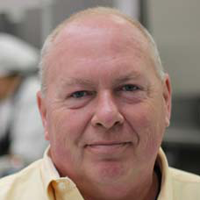 An active member of the American Culinary Federation, he is also an advisory board member for the Hospitality and Foodservice Program at Harper College and the Culinary Program at Elgin Community College. Larry is also active in his community as a member of the Community Character Coalition of Elk Grove, a not-for-profit community-based organization with a vision to create a model community where the quality of life is supported by core ethical values translated into good character practices.